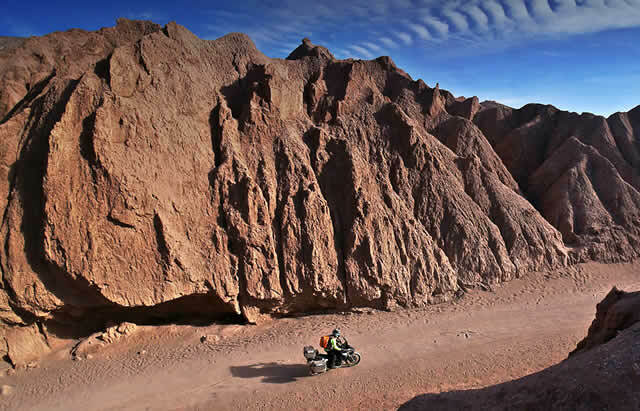 An exciting long-distance ride in Chile, following some of the stages of the famous Dakar Rally in South America, mostly off-road. 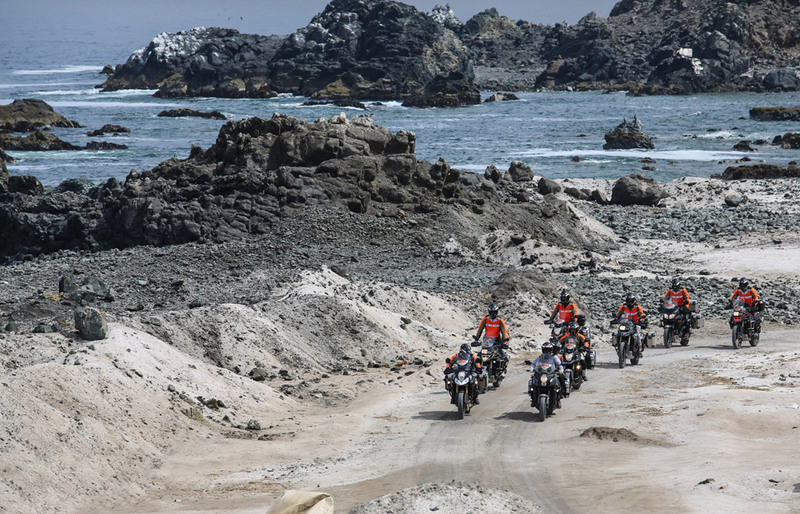 A great adventure, intensely lived by 11 expert bikers, riding super equipped bikes to support extreme performances, dizzying temperatures ranging from 8 to 44 °C in the shade, and heights that rise from sea level up to 4,820 meters. Amongst the motivators of this trip is Jeremias Israel, hired by Honda HRC just to race the Dakar. Amongst the participants, is the great Lucio Cecchinello,Team Manager within MotoGP. is the journalist Mario Ciaccia from Motociclismo magazine. Amongst all the trials we have to endure, the hardest is nature: thin air, dryness and hot wind. 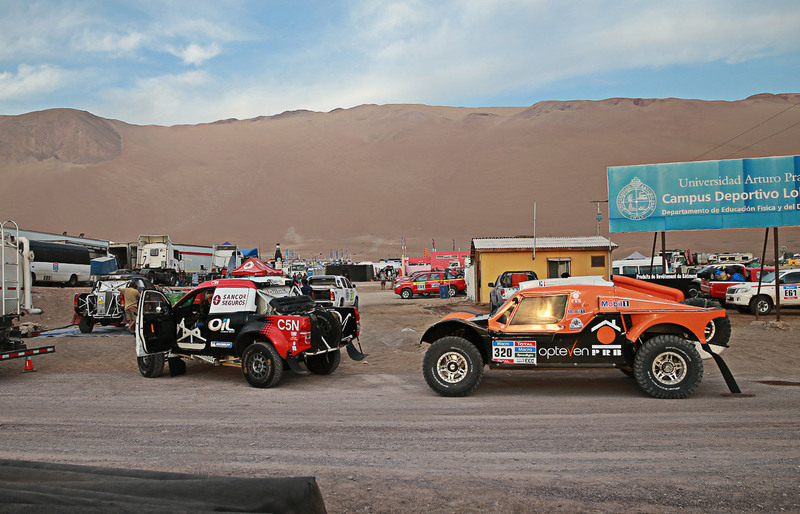 Curiosity, adventure and adrenaline fire us up on asphalt, dirt tracks, canyons and desert to ride 2,500 km in the wake of the Chilean stages of Dakar to the borders of Bolivia and Argentina. Jeremias Israel, a strong Chilean cross rider, extended an invitation: “Cross the Atacama desert during the Dakar race, so you can come over during the rest day in Iquique”. So we decided to live 7 days of extreme experiences, in stunning scenery, with beautiful passes many of which are unnamed, perhaps because they leave you quite literally speechless. 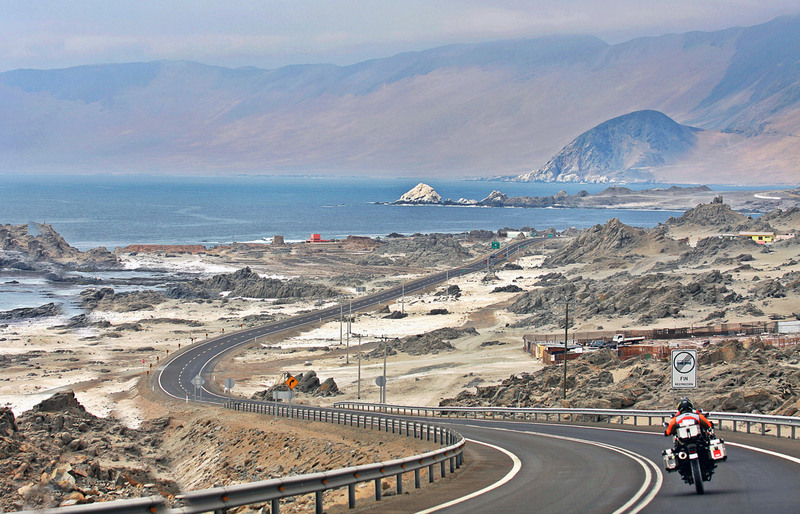 From Calama, a city in the Atacama Desert, we travelled towards the Pacific Ocean until we reached Tocopilla, a town on the coast which was a welcome escape from the furnace of the desert. We followed the wild coast of the Pacific to the North up to Iquique, which has the lowest annual rainfall average, 8 times lower than that of the Sahara desert, famous for its high dunes that plunge nearly 1,000 metres into the ocean. We then rode through the Reserva Nacional Pampa del Tamarugal, populated by the Tamarugo trees, whose roots reach deep into the soil searching for water. 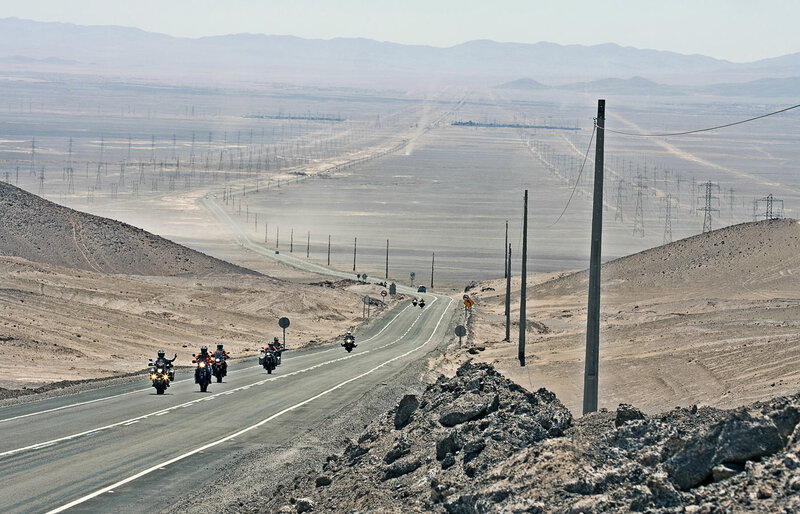 Then we returned, riding along the coast and again we moved inland towards San Pedro de Atacama, about 170 km West from the border with Argentina and 60 km South from the border with Bolivia. We divided into two groups and we surrounded the panhandle of the Volcán Láscar, one of the most active volcanoes in the Andes, until we arrived at the Reserva Nacional Los Flamencos to see the pink flamingos. What an impressive landscape! 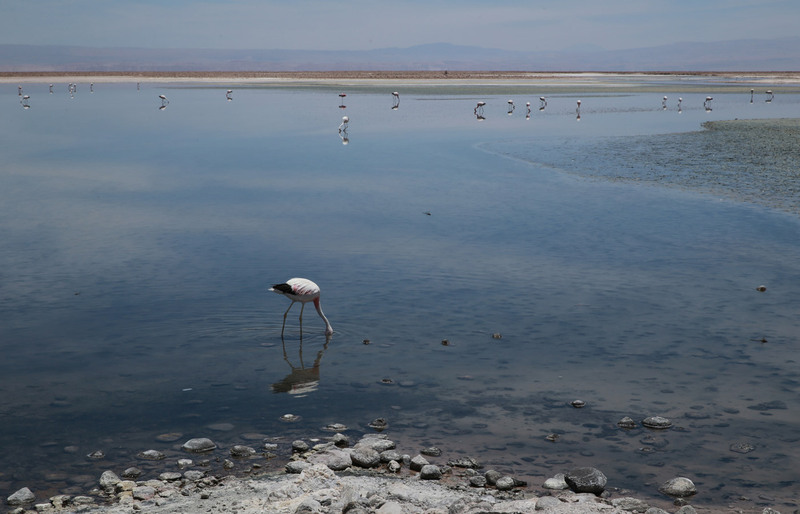 The nature reserve is divided into 7 areas at different altitudes, from warm waters to salt lakes, to the Valle de la Luna… we drove to the area Laguna Miñiques, at the foot of the peak 6,000 metres high. Joseph worked on all of the organizational aspects of our tour. It is no coincidence that he is the GIVI Overseas Operational Director. He travelled the journey riding one of two Suzuki DL1000 V-STROM. He is also a great friend of Lucio Cecchinello. A true, authentic Chilean Guide expert of Dakar and he certainly could not be left out of our adventurous team. The famous journalist from Motociclismo Italia is a hero not only on the track but also off it. Having lived the adventure, he will reveal all about his exciting experience on the Suzuki DL1000 V-Strom in the motorcycle industry press. 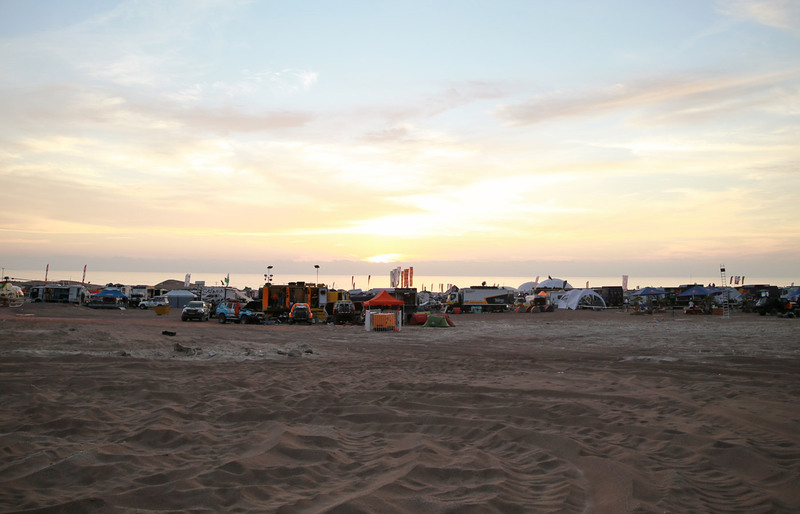 This South American journalist / adventurer spread the word regarding his adventure back home in Brazil by writing an article in Motociclismo Brazil. A travel partner from China. How do you pronounce his name? When faced with our puzzled expressions, he gave himself a nickname: “Call me Stanley (it’s easier)”. Wei Quan He is the manufacturer of the plastic material from which GIVI soft bags are made. Riding with Enrique was LILIANA GAITAN. They are both from Comercializadoras Europea Bogotà in Colombia and they wanted to experience a greater “enterprise”, on two wheels. 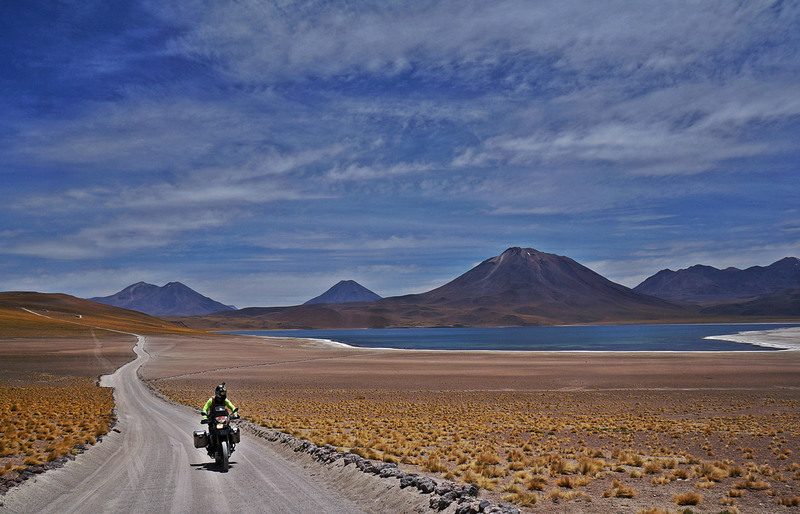 Our Chilean guide, of Procircuit Chile, enabled us to discover alternative routes and beautiful landscapes. An ideal partner on such an extraordinary journey. He never misses an opportunity to test the quality, utility, strength and durability of the equipment. Proud to be part of the GIVI world, with his Sport Car Import Export Paraguay. Years ago Lucio narrowly missed out on winning the World GP 125 and he is now the Team Manager of CWM-LCR Honda MotoGP Italia, where Crutchlow and Miller ride Honda RC213V. He revealed plenty of secrets that were discovered thanks to the cameras mounted on the handlebars of the MotoGP riders! 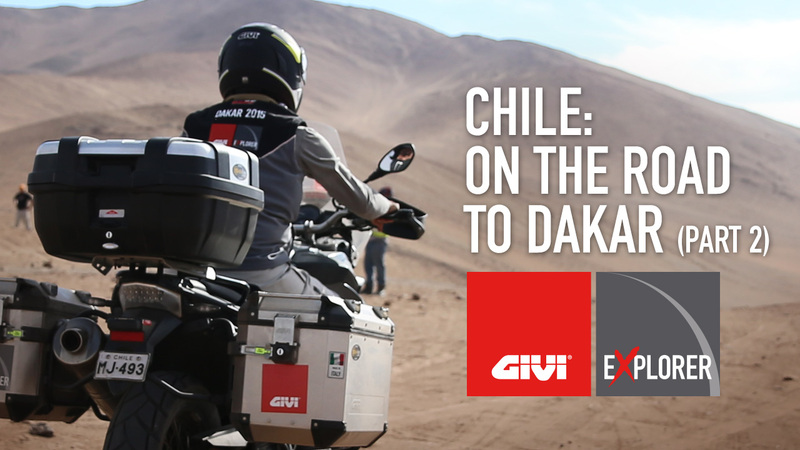 Amongst his technical partners there is also GIVI. And on a ride like the Dakar, he is in his element. Lucio is also a close friend of Joseph Perucca. In our journey Lucio rode the Honda NC750X 55 CV. P.R. 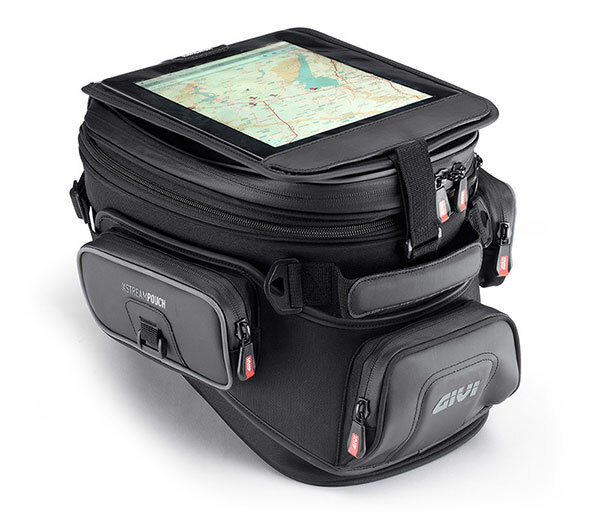 from GIVI USA, is our official photographer. Together with the journalist Mario Ciaccia he recorded many memorable moments from our journey. 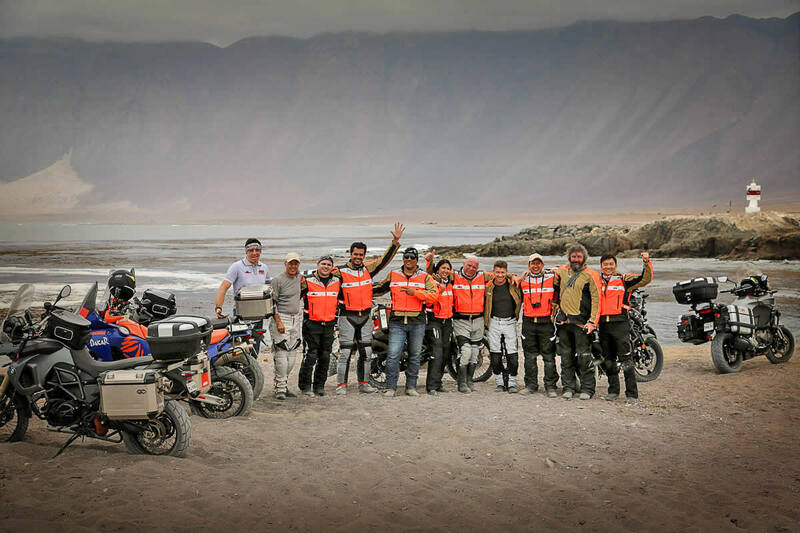 This adventure meant that Pablo was playing on his home ground, thanks to his many skills in desert rallies and bike tours with the Desafío Producciones Santiago Chile. Our 11 motorcycles were fully equipped “to the nines” with GIVI cases and accessories. The 2,500 kilometer route in extreme conditions really put them to the test and they passed the test with flying colours. 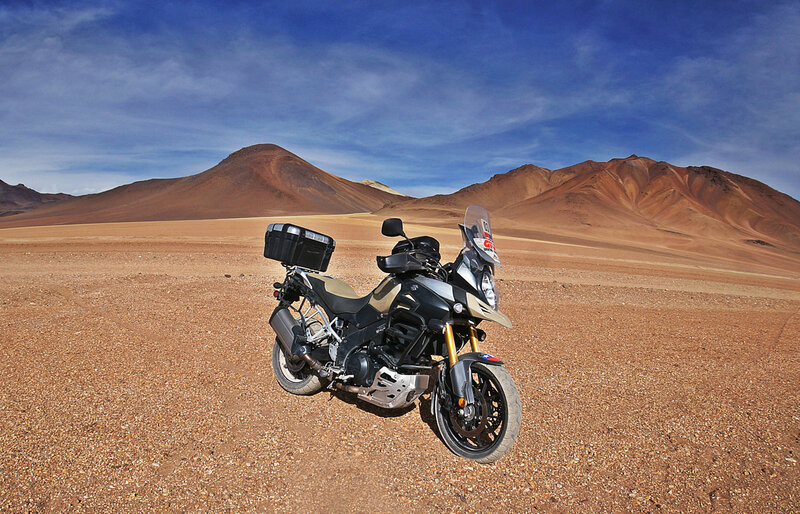 An extreme journey into the desert like our GIVI EXPLORER DAKAR requires bikes equipped with bags, spoilers, engine guards, additional headlights and other efficient and trustworthy “travel companions”, that are able to hold up well whilst maintaining 100% functionality under continuous stress. 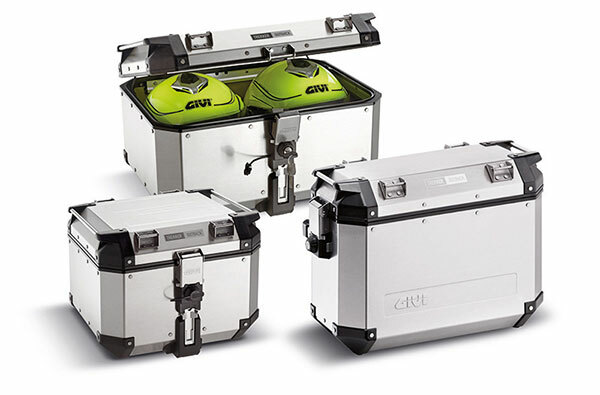 Lucio Cecchinello, who fully approved all the GIVI equipment for the motorcycles and riders, had something more to add regarding the Trejjer Outback Top Case and Side Cases. In addition to being valuable for the transport of personal luggage and other equipment, they also proved to be extraordinary for such extreme use: cold, heat, potholes, rain, sand, wind, dirt tracks, sand dunes, jumps and also… falls. During a journey approaching nearly 2,000 km, they did not prove problematic at all: they were always there, functioning perfectly to our precise requirements..
Enrique Pernigon had particular praise for the strength and load capacity of the Outback Trekker Aluminium Top Case, which is capable of storing up to two modular helmets. 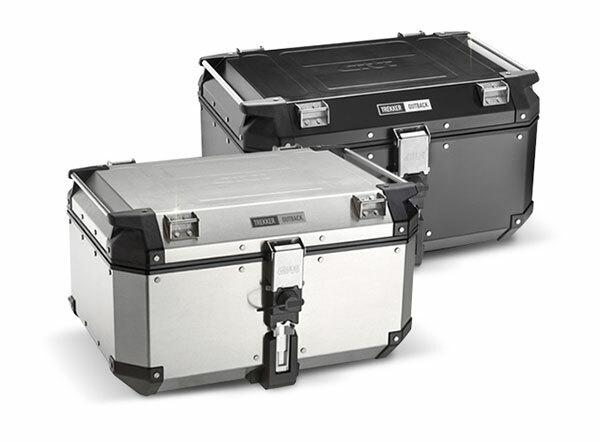 The set of two Trekker side cases that can be opened in two ways, was both very comfortable and useful: during the trip, thanks to the opening from above, and in the hotel, where they were used completely open. 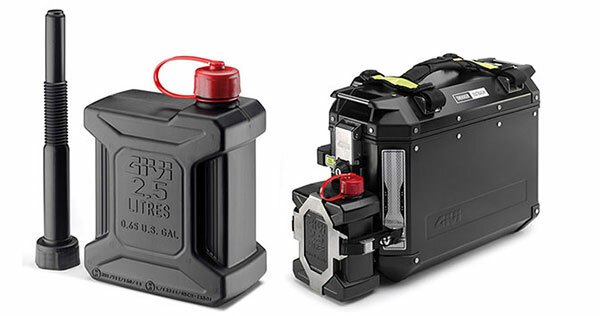 The versatility of the Tanklock tank bags gave us great satisfaction. 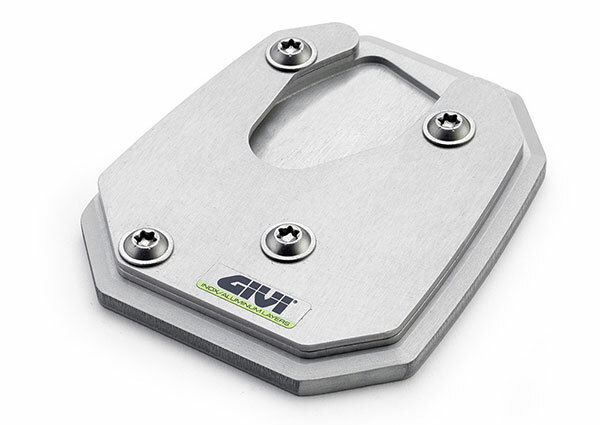 The GIVI patented Tanklock fitting system for rapid attachment provides safe and instantaneous attachment. 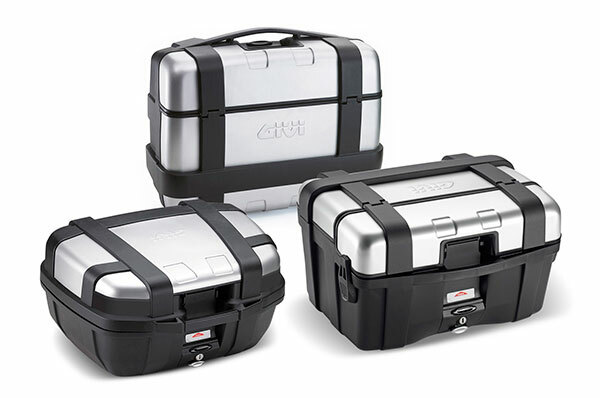 The expandable bags with removable tablet holder are the ideal container for various electronic devices and much more. Among the many difficulties that we faced along the way, were the curves we encountered with bizarre trajectories and these were very deceptive while travelling at night. 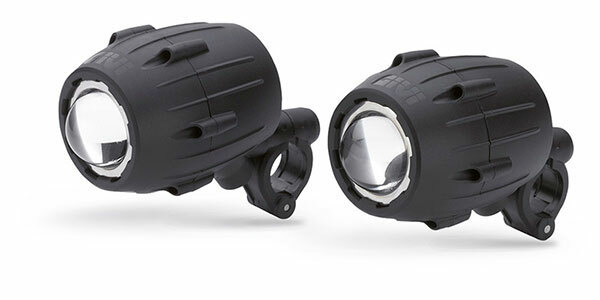 In these instances, the Additional Halogen Headlights were a marvel because they allow you to have a continually clear view of the kerbside. 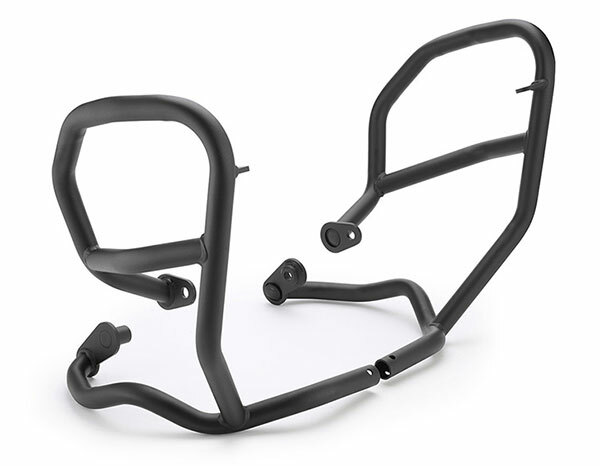 A serious Engine Guard is needed on tracks where there is a potential risk of falling. What about the case of Eduardo Zampieri Silva, the journalist from the Brazilian motorcycle magazine, who went off the road? An Oil Carter Protector is also vital, particularly on stony tracks, in order to help protect the bike’s precious oil supply. What happens when the air becomes suddenly and violently hot? Near a town called Maria Elena, at 1,200 meters in the desert, we had to face a straight road cut by a red-hot wind. To protect ourselves from air and sand, there was the incredibly useful Windshield With Sliding Airflow Screen. It was particularly appreciated by Enrique Pernigon: thanks to its 2 piece format and its special aerodynamic effect. 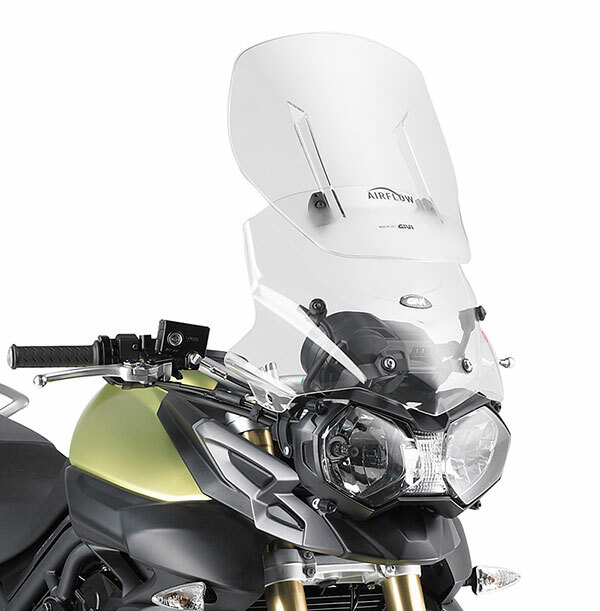 It provides excellent protection, thanks to its height, and when removing the sliding screen you can effectively ride along dirt tracks whilst maintaining visibility. Near the salt lakes and the magnificent lagoon, the Side Stand Extension stopped our bikes from sinking into the muddy sand. 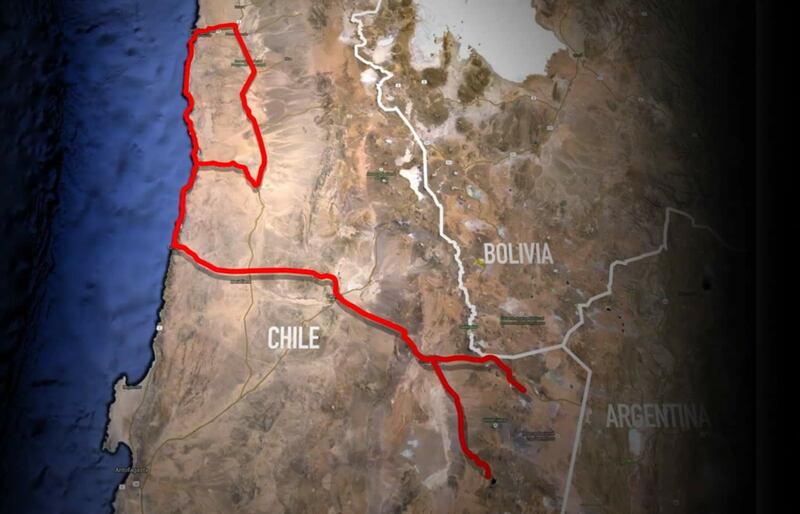 In Chile the considerable distances between one settlement and the next can create many problems. After Tacopilla, for example, the next refueling stop was almost 139 km away with no villages, no houses and no fuel in between. Essential items were the Jerry Can Holders and Jerry Cans. which were filled before the trip! To see the Dakar riders, at 5am Ciaccia and Ambrosioni left dressed as for the Elefantrekken: they needed an extreme Winter outfit to ride to a 4,300 m pass. The Hand Protectors did their job, and for that they earned a score of 10/10. 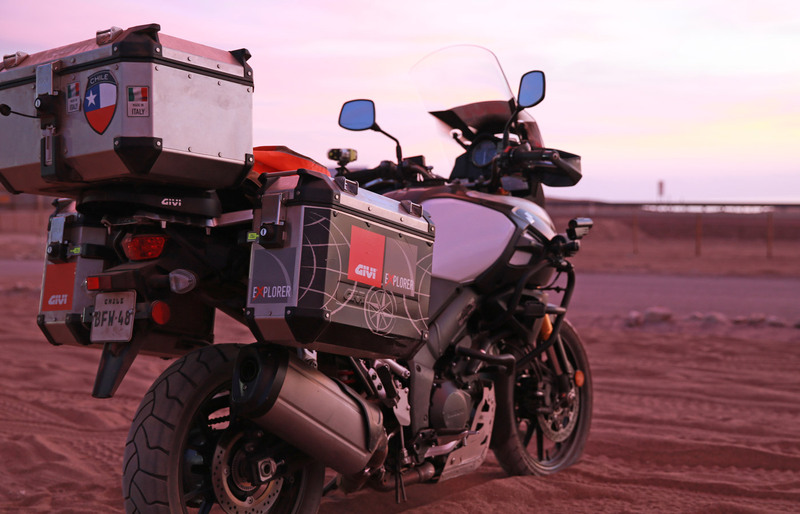 “As always the GIVI CASES AND ACCESSORIES – that I use in all my motorcycle trips – have perfectly met the requirements, protecting my equipment from the heat, dust and torture of long stretches on off-road paths.” As stated by the photographer, Pietro Ambrosioni.